This post is the outcome of being asked repeatedly how Bowen Therapy works, either by patients skeptical of gentle pressure effectively reducing symptoms of chronic pain, or shocked by the fact that gentle pressure successfully relieved their chronic pain where more aggressive treatments did not. It draws primarily on a really great article on the concept of “central sensitization” as a cause for chronic pain by Paul Ingrham, referenced below. Presently, dominant pain theory, and as a result, almost all pain treatments, focus on the tissue affected by injury/having pain (e.g., the joints in a person having arthritis, the neck of a person having whiplash), but ignore the role the brain plays in the experience of pain. Although the impetus for pain occurs in the tissues (e.g., touching a hot pan), pain itself is experienced because your brain is “telling you” there is a “danger” at your hand (“Move your hand!”). Central sensitization is not a theory, it is a physiological fact, operating by a known mechanism (neuroplasticity), explaining the way in which chronic pain modifies your brain and spinal cord in such way that it begins to signal “danger”, in the form of pain, inappropriately. Basically, chronic pain “teaches” your brain that danger is a constant presence. It responds by giving you a constant “be gentle/careful” signal in the form of pain. Pain may remain long after the tissue has recovered from the original injury (e.g., a person may experience muscle aches years after an auto collision). Relatively minor pains may develop into a state of chronic pain (e.g., the development of chronic muscle aching, without any identifiable trauma). Persons may experience pain more intensely than the stimulus suggests they should (e.g., the pain fibromyalgia sufferers experience from gentle pressure; persons having relatively minor joint damage experiencing debilitating joint pains). As I wrote above, almost all pain treatments focus on the tissue where the pain is felt – anti-inflammatories for inflammation at the joints, chiropractic manipulation for misalignment of the spine, etc. Rule-out, or if present, address trauma at the painful tissue (i.e., if you have a broken bone, the brain is correctly reporting a threat – it must be addressed before the pain can subside). Minimize aggravation of the pained area (including aggressive treatments) which may reinforce the brain’s assessment of threat. Being “kind” to your nervous system – essentially manage stress and allow the nervous system to be in a state that it is able to respond to stimuli calmly rather than “freaking out” at every trigger. 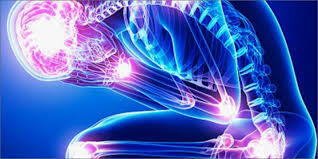 Increase “plasticity” of the brain to foster “re-training” of the central nervous system out of it’s “pain habit”. Bowen Therapy is a method of “gently and cautiously challenging the body”. Although when Tom Bowen developed Bowen Therapy in the 1950’s, the concepts of central sensitization of pain and neuroplasticity did not yet exist, Bowen Therapy treatments and self-care he recommended to support treatments, reflects closely what is known about treatment of centralized pain today. Bowen Therapy treatments are comprised of gentle pressure challenging muscles in areas of pain, followed by pauses integrated into the treatments to allow the brain to become comfortable with and understand that it is “safe” – no harm will occur from stimulus to the area. The after-care recommendations are to be gentle with your body – engaging in gentle motion (e.g., walking), but avoiding strenuous activity (e.g, challenging exercise, aggressive treatments). To further support Bowen Therapy treatments, based on what we now know about centralized pain, I might include meditation and intermittent fasting in a patients treatment plan. Ingraham P. Central sensitization in chronic pain: pain itself can change how pain works, resulting in more pain with less provocation [Internet]. PainScience. Updated 2018 Sep [cited 2018 Oct 10]. Available at: https://www.painscience.com/articles/central-sensitization.php. Sibille K, Bartsch F, Reddy D, Fillingim R, Keil A. Increasing neuroplasticity to bolster chronic pain treatment: a role for intermittent fasting and glucose administration? The journal of pain : official journal of the American Pain Society. 2016;17(3):275-281. doi:10.1016/j.jpain.2015.11.002.